Raag Desh is easily the most well recognised melody in the Khamaj camp. While omnipresent in every form of music, it received widespread recognition due to the well known TV clip on India: Baje Sargam Har Taraf Se, in which a who’s who of Indian classical musicians performed this Raag. Desh has countless compositions – I’ll start off with a sarod composition based on a very famous drut khayal in Ektaal ” Beeti Jaat Barkha Ritu Piya Na Aaye Aeri” (translation: this monsoon season is passing me by, but my beloved hasn’t arrived). 1. The Manjha is played by Imdadkhani musicians – but not by all. I also have modified it slightly from the original manjha. 2. The “killer” meend (portamento) is the one from the Pa to the upper Ma. 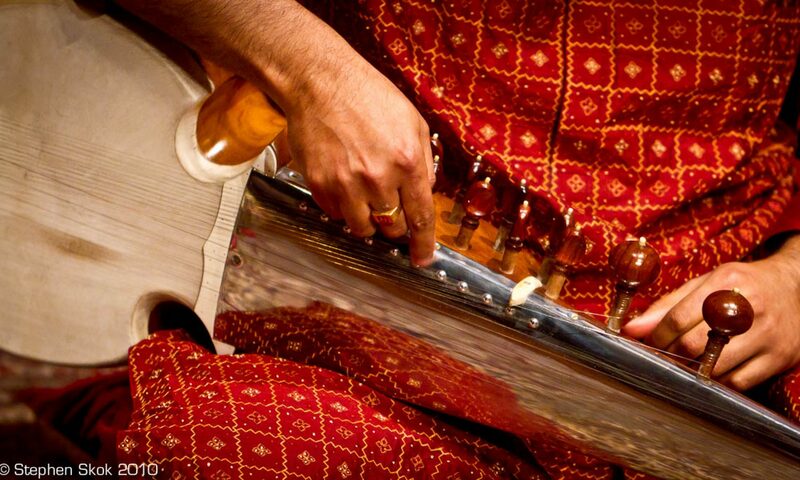 You have to use your second finger on the sarod to do this, and be careful not to under or overshoot the mark. Lastly, as always, this being a one take recording on my Zoom, all errors and omissions are entirely my fault. I’ll put up more compositions in different taalas next. It was a pleasure to hear your rendition of the “Beeti Jaat Barkha Ritu Piya Na Aaye Aeri”. Can you put the notes with the glides/krintans being shown? Thanks for your comments. The notation is very skeletal, and I can certainly improve it. One idea that I’m toying with is to have a Youtube channel with closeups of the fingers showing strokes and movements. Hopefully, that’ll address the question of krintans/meends, as the video can be downloaded and slowed down/sped up. Having a YouTube channel will be indeed a very good idea! I wish the complete notation of the raag desh and related taans.Would you help me to find it.Please help. Kya bat Rahul Bhai, very well played. Thanks for the notation, will try to learn this piece on my hawaiian guitar.